We hosted a college graduation party at our house for our nephew last weekend. My husband’s family was here, including our 95-year-old great-grandmother, all four grandparents in various levels of physical health. This made five generations gathered to hear my brother-in-law speak of his three children, who have now all graduated from college, and we toasted their accomplishments. I sat on the porch with my beautiful daughter Izzy, 16, listening to the toasts and thinking that it won’t be too long before she is graduating high school and heading to college. But our sweet Mack, who died suddenly of sepsis on New Year’s Eve 2012, was not there. Mack, hilariously funny, silly, and determined, just two weeks shy of his 9th birthday when he died, is always missed. 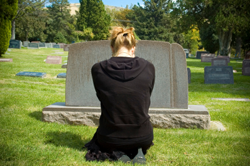 It is a real tension, and one that those of us who are bereaved understand. We are keen to celebrate the joys of life with family and friends — we are all allowed to live! But I have grown another eye that senses another space and time. It is with Mack, in the eternal. As I prepared the flowers and the buffet table, filled the pitcher with ice cubes, I could sense Mack’s presence. He loved when we entertained. I recalled a sentiment written by Martha Whitmore Hickman, who lost her daughter to sudden death in a horseback riding accident. “Keep your spirit open” to your beloved, she wrote. Whitman’s book, Healing After Loss, is a daily meditational book that I carry in my purse. The cover has ripped off, the pages are dirty, tear-stained, and full of notes, but I come back to it for a little courage everyday, throughout the day. Once the last guest left, I was exhausted and had to rest on my bed. My daughter curled up next to me reading funny stories from Buzzfeed. I chuckled to encourage her to read more, but I really just like the sound of her voice. As Facebook posts fill up again with photos of the first day of the new school year, it is easy for each post to be a poignant reminder that there are no new photos of Mack. Every milestone is an opportunity for self-pity. After I have shed some tears, I have to take the emotional reins back, log off from Facebook for a few days, and center myself again. I come to my desk every morning with a cup of coffee and spend time in prayer, I read, and I think of Mack. I picture his face, I remember a moment, I laugh, I cry. Then, I ask God to help me choose gratitude for his beautiful self, his beautiful life, for life with my daughter and husband, and for this day. And tomorrow, I will be back here at my desk and I will need to choose gratitude again. I love your “other eye” you’ve “grown.” That comes so close to how I feel, especially when watching joy and growth around me. Some part of me always goes “home” which is to say, to my 20 year old daughter who died. And at this time of the year I too kick myself daily to remember to be grateful for all the times seeing my daughter off to school, to college. Thank you for sharing this. Cheers! What a beautiful story you have written about your young son, Mack. How sorry I am that he is no longer here to head back to school. It takes so much courage on your part, your husband’s and your daughter, Izzy. I hope your authentic voice here on the page helps you to make it one-word-at-a-time. Your story will touch the hearts of other bereaved parents of which I am one.